Congratulations, having a new kitten is a fun and rewarding experience! The following info will help you over the first six months and beyond. Feline Enteritis – a highly contagious gastroenteritis with a high mortality rate, particularly in young kittens. Feline Respiratory Disease – (cat flu) a highly infectious upper respiratory tract disease, characterised by sneezing, coughing, running eyes, nasal discharge, loss of appetite and mouth ulcers. Young kittens are at most risk from this disease and can suffer recurrent infections. Feline Chlamydia – a bacterial infection causing a painful inflammation and swelling of the tissues around the eye as well as upper respiratory infections. Other preventable cat diseases include Feline Leukaemia and Feline Immunodeficiency disease (FIV). Our vets would be happy to discuss with you the nature and risks of these diseases – and some preventative strategies. Kittens and cats are susceptible to intestinal worms and should be wormed regularly. 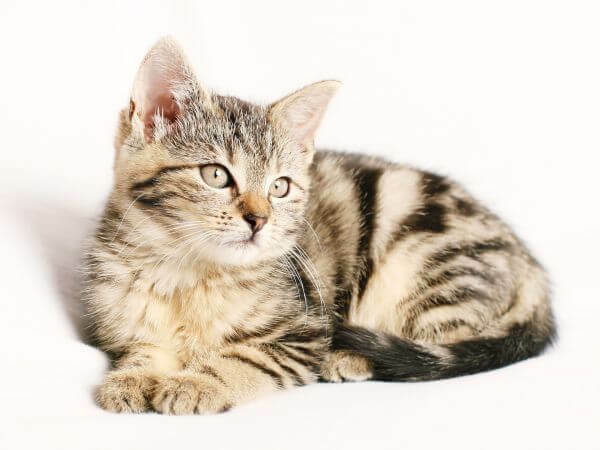 A ‘pot-bellied’ appearance, anaemia, diarrhoea or weight loss may indicate that your kitten has worms. Regularly worming your cat will also help prevent possible human infection by reducing the build-up of worm eggs in your home. An all-inclusive cat wormer that treats hookworm, roundworm and tapeworm, is the most convenient and effective worming treatment. These can be purchased in tablet, paste, or liquid forms (all to be given by mouth), or spot-on (skin) formulations. Fleas are a common parasite for cats and increased confinement and better home heating have made fleas a year round problem. As well as causing irritation, fleas may trigger conditions such as flea allergy dermatitis, anaemia or tapeworm infections. Fleas can be controlled by using one of the easy-to-apply ‘spot-on’ treatments once a month (products include Advantage or Revolution). These treatments quickly kill any adult fleas on your cat and then continue to be effective against all stages (larvae & pupae) for up to 4 weeks. As a result, the flea population in your home is eradicated over several months with regular treatments. Traditional flea collars, powders and shampoos can also be used to control fleas. But some of these treatments can be harmful if used on kittens and they are not as effective as the monthly treatments as they only treat the adults on your cat at the time of treatment. Heartworm disease is spread by mosquitoes and causes a debilitating form of congestive heart failure and lung disease, which may be fatal. Heartworm infection is rare in the Queanbeyan area and this is especially so for cats, consequently we do not routinely recommend heartworm prevention for cats. For convenience, you might wish to consider using an all-in-one parasite control treatment. The ‘Revolution’ monthly spot-on treatment is effective against fleas, worms, heartworm and ear mites which represent all the major parasites found in cats. Desexing prevents unwanted pregnancies in female cats and helps to reduce inappropriate behaviour in male cats such as urine spraying, aggression (cat fights) and wandering (particularly in spring when female cats are often in season). We recommend that all cats (except breeding animals) should be desexed by 6 months of age. Desexing involves surgery to remove the ovaries and uterus of females or the testicles of males under anaesthetic. Dissolvable stitches are placed within the skin in the case of female cats, there are no stitches for males. A revisit is not required. Following the procedure, desexed animals should be kept indoors or confined for a week until healing is complete. Desexing is compulsory in the ACT. There are some great advantages to be gained by keeping your cat confined indoors – particularly at night. These include a decreased risk of injury through cat fights or car accidents and less exposure to diseases. Therefore confinement should improve your cat’s chances of a longer life. Cats are natural hunters and confinement is also the most effective way of preventing them from harming our vulnerable wildlife. Playing games – table tennis balls, boxes, paper bags. Quality time – cuddling, patting, grooming. Window access – for watching the world go by. Providing toys – Kitty Kongs’, scratch poles, paper on a string. Under the NSW Companion Animals Act, all pet owners have new and greater responsibilities, especially in regard to pet identification. Since 1 July 2002, all cats in NSW must be microchipped by 12 weeks of age for lifetime identification and be lifetime registered by 6 months of age with your local council. Microchipping is also the best way to ensure that if your pet goes missing and is picked up by the pound, he or she can be promptly returned to you. Microchipping is compulsory in the ACT. It is important to provide a balanced and complete diet for cats, particularly at certain stages in their lives such as kitten-hood, pregnancy and lactation. We recommend that you feed your cat a high quality, premium brand commercial diet. We can advise you on the best option for your cat’s needs. We regularly stock the Royal Canin Diet and Hills Prescription Diet and can order in other brand products such as Iams and Eukanuba. We appreciate the benefits of feeding ‘natural’ foods to provide diversity in your pet’s diet; nonetheless, care should be taken when feeding only home-cooked meals, so that all aspects of your cat’s dietary needs are being met. Please ask one of our vets for advice if you plan to feed your cat in this way. We highly recommend the inclusion or raw, meaty bones like chicken wings/necks into your cat’s diet as a way of keeping their teeth clean. Cats are notoriously fussy eaters so these are best introduced at a young age so they become used to them. Keeping your cats teeth clean is an important part of their care as poor dental health can not only be unpleasant for you and painful for your cat but is also associated with other diseases such as heart disease, kidney/liver disease and septicaemia. If your cat refuses to eat raw chicken bones you can give raw meat (given as a chunk – not bite sized pieces) or one of the premium brands ‘dental’ diet (Royal Canin Dental or Hills T/D) which provides them with a complete and balanced diet whilst keeping their teeth clean. Note: Be aware that raw chicken can carry salmonella so use fresh human quality, don’t leave it out for hours if your cat doesn’t eat it. If young children are around or immunocompromised people consider other alternatives. Raw chicken can be placed in boiling water for 3 to 5 minutes to reduce this risk – this does not cook the bone. Whatever diet you choose, obesity is becoming a common nutritional problem seen in cats. Excessive weight contributes to many chronic diseases and can reduce the quality and the length of their life. It is important to get into the routine of measuring the amount of food given and having set meal times instead of leaving food out all day.